The Jenks Museum of Natural History and Anthropology, one of Brown University’s vanished museums, has been given a second life. A display of the re-collected remnants of the Jenks Museum. Photo by Jodie Goodnough. A group of students, professors, and artists calling themselves “The Jenks Society for Lost Museums” has spent the past year researching the Jenks Museum, re-collecting scattered relics and remnants, and transforming words into rooms and fragments of curatorial description into spectral art. 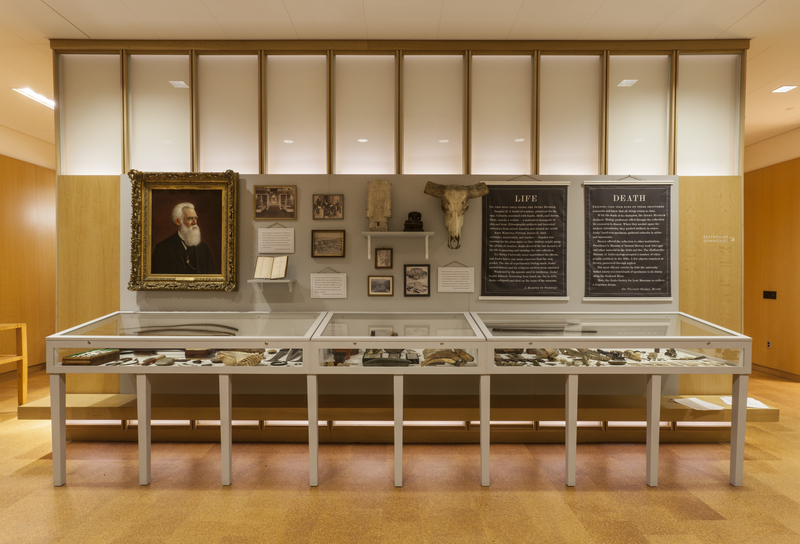 They have built a three-part installation that re-imagines the office of the museum’s founder, showcases the remaining fragments of the collection, and conjures the ghosts of artifacts once found in the museum back into existence – as reimagined by over 80 artists. 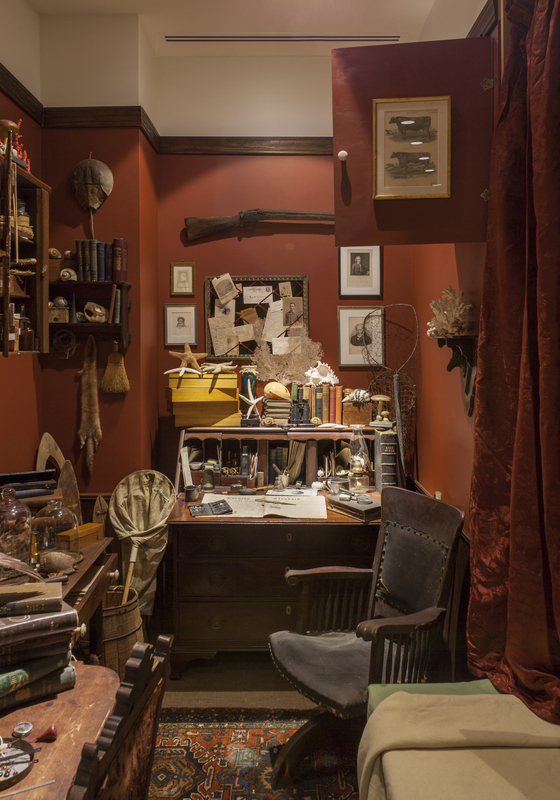 Professor Jenks’ office, reimagined based on Dallas Lore Sharp’s “A Bed in the Museum.” Photo by Jodie Goodnough. An axe and a gun, bottles of arsenic and a walking stick, portray John Whipple Potter Jenks, founder of the museum. Tattered labels speak of fragility and decay. The installation tells the story of Jenks and the museum that was his life’s work, of his sudden death on the building’s steps and of the museums subsequent decline. The collection – 92 truckloads of artifacts and specimens – hauled to a dump on the Seekonk River. It is a work of art that relies on subtlety and rewards the curious, a story that displays loss over time and demonstrates the uncertainties of preservation, an exhibit that presents a memory of the past and promotes hope for the future. The Lost Museum will be on display in Rhode Island Hall on the Brown University campus, 60 George Street, the Jenks Museum’s original home, through May 2015. Hours are 8AM – 5PM. The installation is supported by Brown’s 250th Anniversary, Brown’s Mellon Foundation Sawyer Seminar “Animal Magnetism: The Emotional Ecology of Animals and Humans,” the Creative Arts Council, the John Nicholas Brown Center for Public Humanities and Cultural Heritage, and the Joukowsky Institute for Archaeology and the Ancient World. 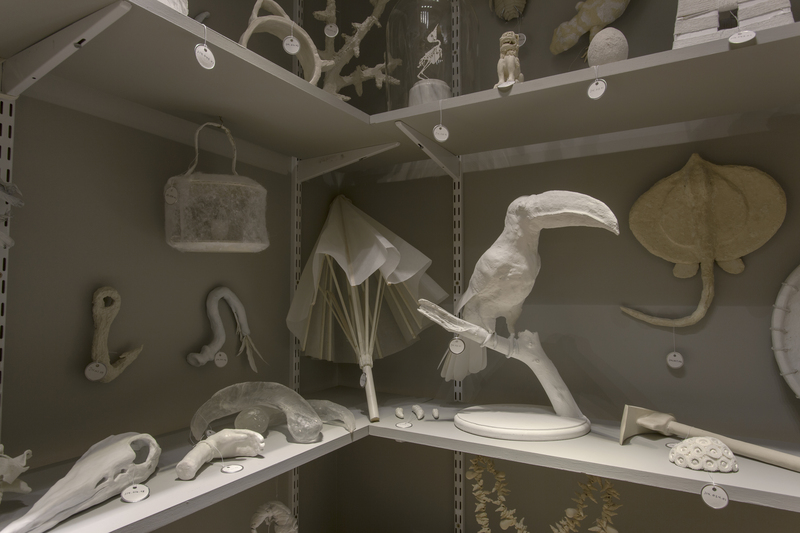 Museum Storage, home to the ghosts of the Jenks Collection, as created by over 80 artists. Photo by Jodie Goodnough. Hello, I’m trying to track down an artifact referenced in the 1902 book Bessboro by Caroline Halstead Royce. Royce says in a footnote that the object was donated to “the museum at Brown University” which I’m presuming at the time the book was written (1902) was the Jenks museum. It is described as a “little ebony image of the Virgin and Child” found among the sand and pebbles of the shore of Lake Champlain in 1875 by Dr. Sewall S. Cutting. The specific location is Hunter’s Bay in Westport, NY, and the “image” or what I’m assuming is a figurine, is supposed to have been lost by a missionary, several of whom, including the unfortunate Father Isaac Jogues, were known to have frequented this area. If the object was made of ebony wood, it may have been burned in the fire, but if it was stone, maybe it still exists. Do you have any information on whether this item is part of the remaining collection you have assembled? The reason I’m so interested is that Hunter’s Bay is currently owned by my family and I’ve become fascinated in learning some of the detailed history of the property. It would be so cool to see this object from the 1600s that was found on our property! Thanks very much for getting in touch with us. That sounds like a fascinating object and piece of Hunter’s Bay history. Unfortunately we cannot find any object that matches that description in our (incomplete) list of objects that had been in the Jenks Museum. That certainly does not mean that the object never was in the Jenks Museum – since the accession records were destroyed in a fire, our knowledge of the collections is incomplete. Sorry we can’t give you more information than that. We will be in touch if any information turns up. Good luck with your research and let us know what you find out! I just stopped by Providence today specifically to see this museum. The recreation of Jenks’ study was great! I would love to read the full Atlantic Monthly article mentioned in the pamphlet.